The word, Yoga, literally means to unite. Some say it is the uniting of individual consciousness with higher consciousness. Others believe it to be a state of realization. However, practically speaking, it is a state of unity, balance, and equilibrium, between body and brain, brain and mind, mind and spirit. 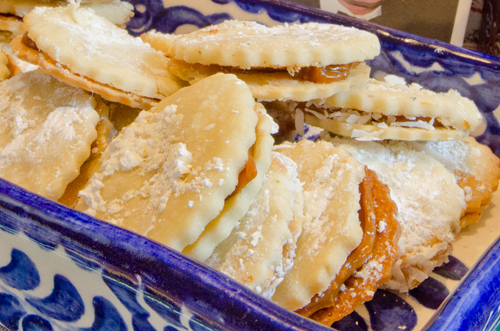 In food terms, it is the alfajor–spiritual equilibrium found in the form of a cookie. A state of unity, a balance between taste and absolute comfort for the mind and spirit. Two light butter cookies with a layer of dulce de leche or sweet caramel cream – and rolled in coconut, a favorite South American cookie. Known as arequipe in Colombia, manjar in Honduras, dulce de leche (sweet milk) in Mexico, this is about as close as one can get to sweet harmony. If you are lucky enough to have a Latin American bodega with dulce de leche in stock, even better, or, just boil a can of condensed milk for three hours, keeping the can covered in the boiling water and your caramel filling is ready. Adding cinnamon and nutmeg or even a dash of chipotle powder only heightens it decadent taste. Closing your eyes and biting into this cookie will certainly make one have a new appreciation for the term yoga. Ohm, yum, ohm, yum. And they are delicious dipped in chocolate!